Long-term Comfort and Durability: Mesh seats and backrests offer comfort, support, breathability and easy cleaning without sacrificing long-term durability. 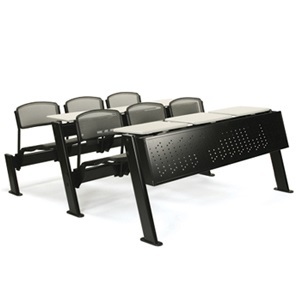 Seats and Work Tops: Self-activated, spring-free, flip-up seats combined with anti-panic retractable tops are engineered for a lifetime of trouble-free operation and a uniform appearance when not in use. High-Density Solution: 40% greater density than desks and chairs, and 25% greater than swing-out type seating. The end result is increased density in a smaller footprint with full code compliance. Free-standing option available. Green Check Certified: An outstanding 45% post-consumer recycled content. Squeeze is independently tested to exceed Green Building Council's LEED-CI Indoor Environmental Quality Standards and may comply with MRS 5.0.